The creation of plants in their many diverse forms is apparent in the intricate design of plant systems. In virtually all cases a new taxon appears for the first time in the fossil record with most definitive features already present, and practically no known stem-group forms. Evolution claims that plants descended from algae as they colonized the empty landmass. Plants couldn’t have evolved until there was a sufficient ozone layer to block radiation. The many structures that plants require in order to overcome gravity, keep from drying out, and reproduce would have to have developed gradually over millions of years. Molecular and fossil evidence has complicated the evolutionary model that explains how plants evolved from simple to complex forms. The simple groups are evolutionary dead ends; so plants must have evolved simultaneously in several different ways. Seed plants are alleged to have had an advantage over other ancient plants, and they dominated the landscape. 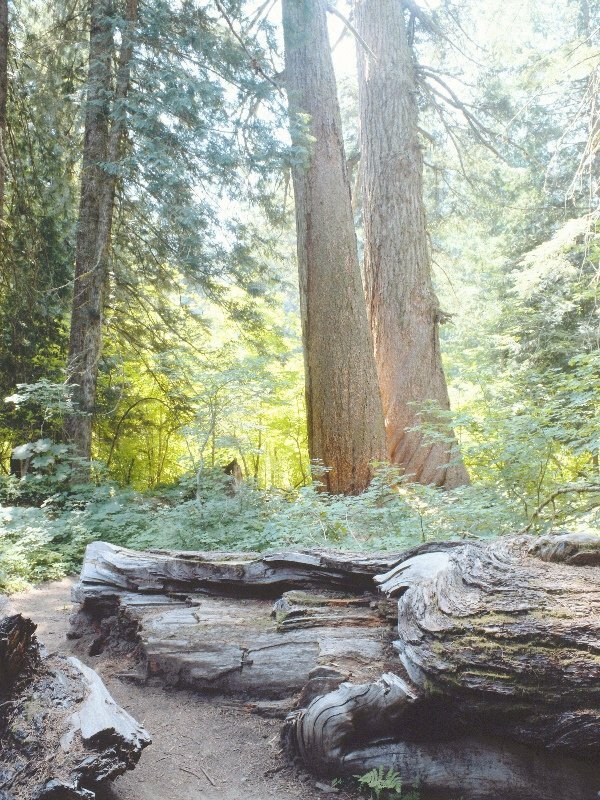 The ancient forests are the source for the different coal beds in evolutionary theory. Flowering plants were the most recent to appear since leaves were remodeled to attract pollinators and accomplish reproductive functions. Despite this evolutionary story, the Bible describes the creation of different kinds of plants in Genesis 1. The presence of “living fossil” plants like the Gingko biloba tree makes it clear that evolution is a plastic theory that can accommodate both rapid change and stability for hundreds of millions of years. The creation of plants in their many diverse forms is apparent in the intricate design of plant systems and the symbiotic relationships that could not have evolved in a gradual process. In the evolutionary story, plants arrived relatively late in earth history. The first fossils of plants are supposed to be 475 million years old. 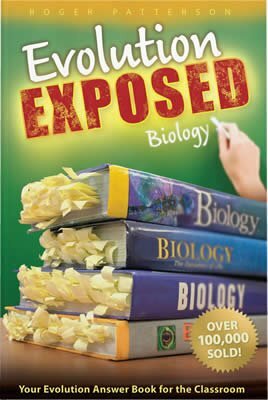 Evolutionists generally agree that plants evolved from algae that slowly began to colonize the land. This could not have occurred until after there was an intact ozone layer to protect the plants from some of the atmosphere’s harmful UV rays. Since this was an alien land, plants had to adapt to the new landscape. Several key systems had to be developed to prevent drying out (desiccation) in the air, to absorb nutrients from the soil, to grow upright without the support of water, and to reproduce on land. In evolutionary biology, adaptations are often acquired by modifying existing structures to accomplish new tasks. In the case of algae turning into plants, the preexisting structures are mostly absent. Few algae have differentiated tissues that could be adapted to a new use. To get around this, some suggest that fungi invaded the land with the plants to help in absorbing nutrients from the soil. There is much evidence of plants and fungi living in symbiotic relationships today, but nothing to suggest that they evolved to help one another. The adaptations shown in this figure allegedly developed over millions of years as plants had to acquire new features to be able to survive on land. Superficially, similarities between the algae and plant are shown, but the information required to produce the new structures and their functions cannot be explained within the evolutionary framework. Each of these groups was created with the features and information they need to survive in the conditions in which they live. 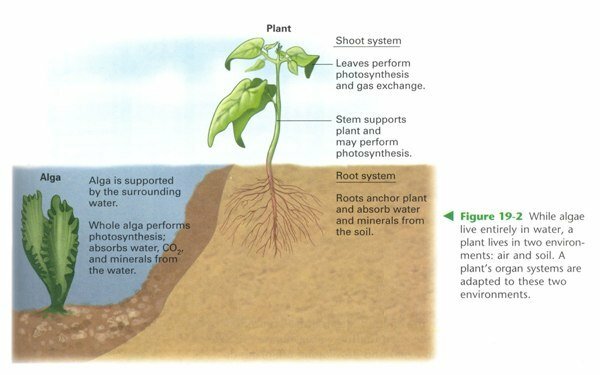 The vascular plants are supposed to have evolved separately from other algae. The ferns, club mosses, and horsetails (pteridophytes) are the suggested common ancestors to the vascular plants that are present in large quantities today. The Carboniferous era is described as having giant ferns and club moss trees, none of which survives today. The vast forests of the Carboniferous are the source of many coal and oil reserves in the evolutionary model. The next step in the evolutionary story is the development of seed plants. The first to evolve were the gymnosperms, cone-bearing plants like conifers, ginkgo, and cycads. These plants had an adaptive advantage over the pteridophytes and dominated the forests of the late Paleozoic era. The evolution of flowers and seed protected in a fruit led to the next branch, the angiosperms. The production of flowers and fruits has a cost, but this cost is outweighed by the benefits. And many adaptations have led to diverse types of flowering plants. Along with these new information-gaining changes, many intricate symbiotic relationships supposedly developed. Many exclusive symbiotic relationships exist between fungi, bacteria, and insects. If these relationships are disturbed, the plants either do not survive or are less able to compete. The scenario that explains how a complex symbiotic relationship evolves seems to be a Catch-22 in evolutionary scenarios. If the bee doesn’t have a certain shape, it can’t get to the nectar, but it is the only bee with the right body shape to distribute the pollen for the flower. If either is not in place, the other does not survive, or it is not as fit as its competitors. The presence of living trees that are virtually identical to fossil species, like the ginkgo shown here and the Wollemi pine, demonstrates the failure of evolution to make useful predictions. Living and extinct trees are proof that evolution can keep things the same for hundreds of millions of years or make drastic changes—take your pick. Another problem facing the evolutionary story is the presence of fossil plants that have not changed in hundreds of millions of years. 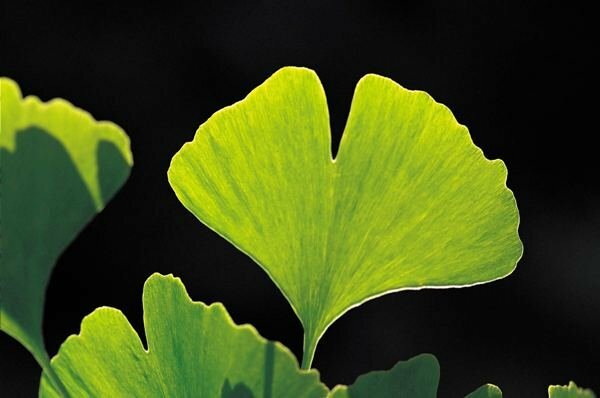 The species Ginkgo biloba is known from fossils that are supposed to be 200 million years old. Another “living fossil,” the Wollemi pine, was recently discovered in Australia. The oldest fossils of this plant date to over 90 million years. The plastic theory of evolution must accept that these plants are evidence that evolutionary forces can act by holding still for millions of years, even though evolution can explain the rapid appearance of new species. If evolution means that things can evolve fast and slow, how can it be used to make predictions? 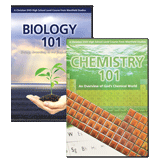 Despite the evolutionary story provided for the evolution of plants from algae, the appearance of new information, the symbiotic relationships required, and the sequence of fossils point to a Creator. There is no reconciliation between the two models—plants were created by the Creator, not by chance and time. A paper published in 1966 by C. L. Burdick put forth the claim that pollen and other organic material was found in the Hakatai shale of Grand Canyon. If true, this would push back the date of the origin of plants to the Precambrian era. 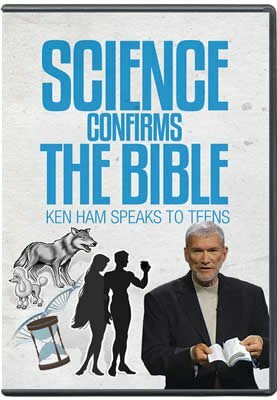 No secular or evolutionary scientists would even bother spending time and money researching such a topic. It has been suggested by various sources that the samples were simply contaminated by modern pollen or that pollen grains had worked their way into cracks in the rocks. Several authors have defended the work and refute the claims of those who challenge the findings. Later papers noted that microspores have also been found in Cambrian rocks in India, Australia, and Russia. The evolutionary sequence of plants is not displayed in the fossil record even though the story is told in textbooks. At least four different evolutionary lines are supposed to have emerged from prehistoric green algae—the common ancestor of all plants. In a recent text on plants, not a single fossil series is provided to support the phylogenetic trees that explain the evolutionary history of plants. The grand claims are laced with words like “probably,” “apparently,” and “presumably.” The places where the fossil record is the most complete should provide the clearest picture of evolution, but this is where many evolutionists disagree. The lack of fossil ancestors for the major groups would seem to be important, but the evolutionists fill in the gaps with imagination, not science. The evidence clearly points to diverse groups created in the supernatural events described in Genesis. The evolution of plants offers unique challenges to evolutionary scientists. The simplest of plants are said to have evolved at different times from some type of chlorophyte algae, but they did not give rise to the more complex vascular plants. As you move up the evolutionary ladder, there are no known ancestors for a majority of the major phyla of plants, and the chemical relationships do not support the common evolutionary models. Major changes to the organization of the phylogenetic tree of plant evolution have been suggested, but the order of events is still being debated. In many cases, the claimed ancestors appear later in the fossil record. A new weed species has been identified in Britain. The new species is actually a hybrid of two existing species. The fact that new species of plants can form as a result of the mixing of existing genes is not evidence for evolution in the molecules-to-man sense—there is no new information generated. It does, however, confirm the creation model that says plants were created to reproduce after their kind. The fact that these plants can interbreed makes it clear that they are a part of the same original kind. Even though these weeds are raised up in the media as examples of evolution in action, they fail to show how dramatic changes—like the algae-to-plant story from the evolutionary past—can take place. Extrapolating the small, information-losing mutations to explain major, information-gaining changes is bad science. The fact that the age of the oldest known trees corresponds to the biblical date of Noah’s Flood cannot be easily explained by evolution. There is no reason that trees much older than 4,500 years should not be found on earth—unless a global catastrophe wiped them out. A group of Huon pines in Tasmania has been claimed as the oldest living organism. Scientists have “dated” the tree at “more than 10,500 years old.” From the creationist perspective, it is not possible that any trees much older than 4,500 years could exist since the catastrophic nature of the Flood would most likely have removed all vegetation from the surface of the earth. The age of the group of trees, which are clones based on DNA samples, was not determined by ring counts, but by the presence of pollen in samples drilled from a nearby lake. Traditional tree-ring dates give ages of no more than 4,000 years. This is close to the oldest bristlecone pines from the Rocky Mountains, which have 4,600 rings. The fact that the ages for the Huon pines are estimated from pollen in a nearby lake means the dates are based on many assumptions. One scientist associated with the study noted that the media had run the story prematurely and that the claim was not yet substantiated. Tree dating involves many assumptions, but the fact that the oldest known dates are near 4,500 years confirms the date of the global Flood described in Genesis. Apart from the Flood, there is no reason why trees older than 4,500 years should not be alive today. Since there are no known transitional fossils for major plant groups, how can scientists accurately describe their evolution? How do scientists explain the fact that no individual trees are found to be older than about 4,500 years? Do symbiotic relationships represent a kind of Catch-22 for evolution? Since grass is not supposed to have evolved until after the dinosaurs became extinct, why is grass found in dinosaur dung? Why has pollen been found in rocks classified as Precambrian (long before even the earliest plants are supposed to have been present on the earth)? Sexual reproduction would have had to evolve independently in plants and in several different ways. How likely is it that the process of meiosis would evolve many different times in plants, as well as in animals?